Sometimes, markdown plus a database is enough. Model your schema and queries live, as fast as you can think. Experiment, stage, undo. Your application and its APIs are formally specified as data. Hyperfiddle uses your app specification to reify your APIs and basic UI scaffolding with core.match. Hyperfiddle loads just the right data, automatically. Your app specification captures your API inter-dependencies as a graph, so data sync reduces to a graph partitioning problem. 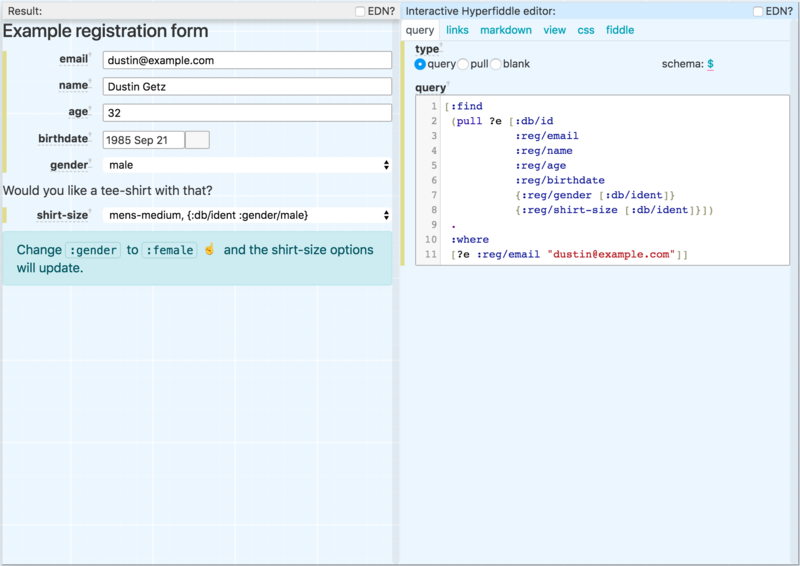 Hyperfiddle optimizes your service dynamically in ways hand-coded backends cannot. Both the Hyperfiddle and Datomic ontologies are semantic (like RDF), which means Hyperfiddle understands the structure of what you build. Concerns like datasync and routing, forms, typed widgets, and CSS classes are automatic by default. Architected from the ground up for Datomic Cloud Ions. Each hyperfiddle is a static site, every API response served Cache-Control: Immutable, everything is proxied by CloudFront. You do the work of four men in part-time. I have heard a lot of talk over my entire career in Silicon Valley but have never, ever seen anyone deliver like Hyperfiddle. We had a go at making a prototype on App Engine, Postgres database, HoneySQL, doing all these nested SQL queries. I haven’t spent a ton of time in SQL but I’m like, this is so stupid, why am I wasting time using anything but Datomic, and Hyperfiddle seems the natural way to build an app on top of Datomic. You’ve spent time figuring out how to glue the user interface to the data model, and all these things that a normal website needs, solved reasonably. This is something I want to spend time understanding how to do. I want to use datomic for machine learning model management and I thought hyperfiddle may be a great way to build a UI that will visualize model metrics/performance. I use Datomic heavily day-to-day and am familiar with API design, but I'm not a web developer, which is a big sticking point for me. I'm building a web/mobile app with a datomic-based backend, and we have a lot of server side data processing, ETL, need for manual data checking and admin and so on and it seems like rather than reinvent the wheel for all these "back of house" UIs it would be great to have something like Hyperfiddle solve that out of the box.